"The Negroes of this area make their living by growing abaca; of which the region is one of the most plentiful providers. 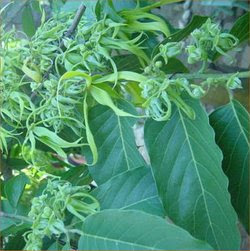 They also gather ylang-ylang, which is found in their mountains. Ylang-ylang is an expensive perfume well known in elegant society; in Paris it currently costs five hundred francs a kilogramme, and at one time it cost twice this amount. The flower which provides the essence grows in a very tall tree only found at altitudes of five or six hundred metres:"
"...unfortunately it is disappearing, for those who make their living by gathering the flowers find it simpler to cut down the tree when it is in full bloom than to climb it: which, moreover, is no easy task." Unsustainable local agricultural practice that tried to cope with a growing demand from an early example of a global market, spelled the doom for the industry which would build such fragrance houses like Coco Channel (whose Channel No. 5 has ilang-ilang as a major ingredient) and YSL, the patent owner of ilang-ilang. Another reason is the Pinoy's penchant for poor imitations, summarized in the phrase: puede na. While Shteck's success in the business prompted others to venture into the business; they came out, however, with low quality products or worse, artificial oils. I FIND YOUR BLOGS VERY VERY INFORMATIVE AND VERY RICH IN PERSPECTIVE. MAY YOUR BLOGS CONTINUE AND INCREASE. I will try to promote your site in my facebook account and to my friends. I'm a big fan already. As a matter of fact I am asking my kids to read your articles so that they too, would be proud of our heritage and our roots. many thanks. This is a twice told tale, with the retelling revealing the return of the repressed - a curt tale, curtailed like a curled tail, in metaphor that is the vengeance of poetry.